XIX "Course of Study" was then taken up with a review of the previous lessons. At the close of the lesson Mrs. Miner announced to the members that here after we would have a review of the whole number of previous lessons each meeting. 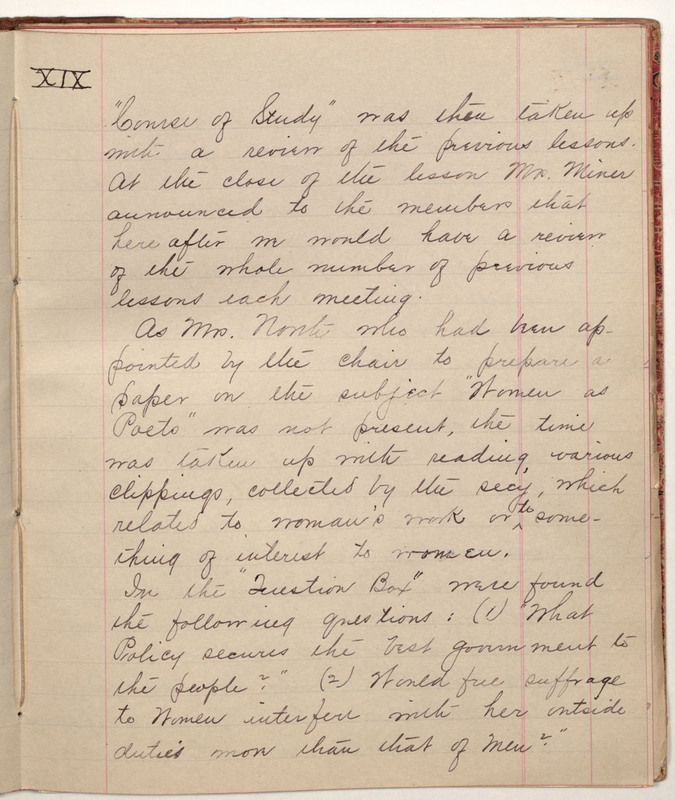 As Mrs. North who had been ap-pointed by the chair to prepare a paper on the subject "Women as Poets" was not present, the time was taken up with reading, various clippings, collected by the secy, which related to woman's work or to some-thing of interest to women. In the "Question Box" were found the following questions: (1) What Policy secures the best government to the people?" (2) Would free suffrage to Women interfere with her outside duties more than that of men?"